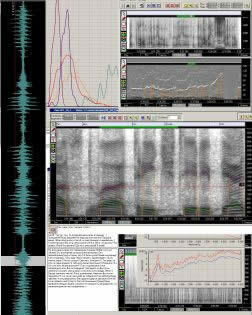 «OTExpert» software application is designed for the purposes of automation of forensic audio examination research. The system contains full set of tools and methods for all audio forensic tasks solved by the expert: forensic audio decoding, speech processing and preliminary analysis including preprocessing, speech intelligibility improvement, sound to noises level evaluation, forensic audio authenticity verification and forensic speaker voice identification. The system is approved by scientific council of Russian Ministry of Justice Forensic Examination Centre. The system contains several modules and can be configured according to particular list of forensic tasks solved in the forensic division. ID-Expert is a general software shell, containing basic functionality for audio signal analysis and additional tools and methods for forensic audio decoding, speech preliminary analysis and forensic speaker voice identification. Special instruments designed for modern methods of audio investigation and speech signal analysis are implemented to be convenient and intuitive. easy export options of charts, text and images. Audio decoding tools provide text and speech synchronization for search of matching words in two audio signals automation. Wide functionality of user marks allow to collect speaker phonetic profile and to find matching phoneme/articulations in two speech signals. TD-Expert – module is designed for forensic audio authenticity analysis, detection of editing and audio manipulation traces, signal and signal properties continuity breaks, traces of previous coding by psychoacoustic codecs. Modern and scientifically based method of psychoacoustic codec traces extraction over signal properties without using information from file header (which is analyzed by means of HEXExpert module). codec frames order and periodicity analysis. HEX-Expert is designed for audio and video file structure and file header analysis. Additional module FAT-Expert allows to conduct the research of media data storage to prove the original file was recorded by the device and have not been manipulated. ENF-Expert is the module dedicated to analysis of power supply (Electric Network Frequency) pickups, appearing in every forth real case examination. automatic date and time labeling of audio according to ENF database.